A 90-year-old man with a history of prostate cancer was admitted with haematuria and mild normocytic anaemia on routine blood tests. Baseline observations were normal and chest X-ray was unremarkable. Electrocardiogram (ECG) showed tri-fascicular block. He underwent successful bladder irrigation. Prior to discharge, he suffered a syncopal episode: ECG confirmed tri-fascicular block, for which he was discussed with the cardiology team for consideration of permanent pacemaker implantation. 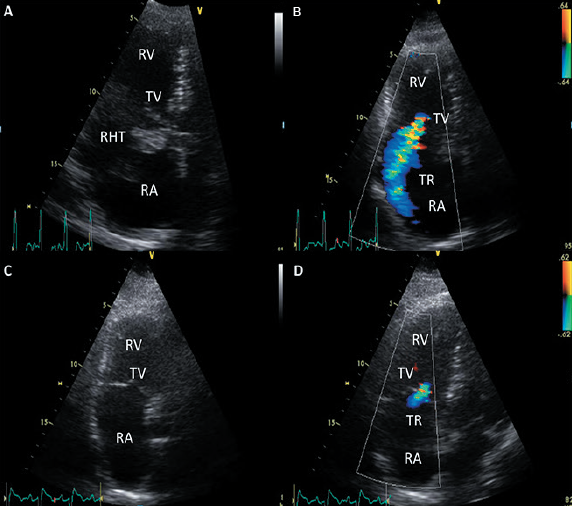 Pre-procedural transthoracic echocardiogram (TTE) revealed a large mobile thrombus attached to the tricuspid valve (TV) and extending to the right ventricle (RV), significant RV impairment and severe TV regurgitation (figure 1A–B). Following discussion between urology and cardiology teams and, in view of the significant risk of massive pulmonary embolism (PE), the patient underwent urgent thrombolysis. This was not complicated by significant haematuria. Post-intervention TTE demonstrated complete dissolution of the right-sided thrombus and mild TV regurgitation only (figure 1C–D). Warfarin was started and no further haematuria or syncope was reported on subsequent follow-up. Right heart thrombus is a life-threatening condition commonly seen with structural heart disease, atrial ﬁbrillation, devices in superior vena cava or right heart, thrombophilia and malignancy. It is associated with an incidence of PE of 97%,1 in-hospital mortality of 44.7%2 and mortality of 100%, if untreated.3 Treatment options include thrombolysis, anticoagulation, surgical or percutaneous thrombo-embolectomy, although evidence of optimal management is lacking. This difficult case, complicated by haematuria, emphasises the successful outcome achieved with thrombolytic treatment. Thrombolysis presents the lowest mortality rate, and allows rapid improvement of pulmonary reperfusion, pulmonary hypertension and RV function and simultaneous dissolution of intra-cardiac thrombus, PE and venous thromboembolism.